Looking for some great reading in the library? Please Ask! All of our customer service staff are trained to use their reading knowledge and available resources to respond to requests. For both assistance with finding information about authors and titles, and to suggest similar authors and titles. 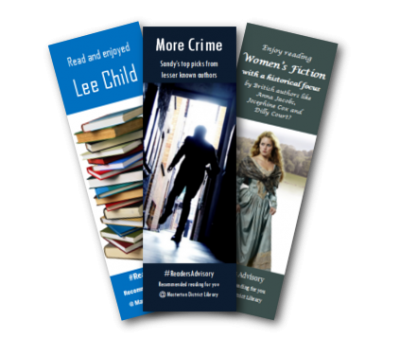 Check out the author bookmarks by the returns slot and help yourself, or view our bookmarks online and print them at home. A selection of new titles, authors and series are featured on our display screen above the circulation desk. A list of coming titles by popular authors is available from the Hot Picks shelves. This updated each month. More information about the item incuding – a summary, subject headings, a series link. Reviews if another borrower has reviewed it. You can even write your own review. Other editions of the title, such as large print or a talking book. 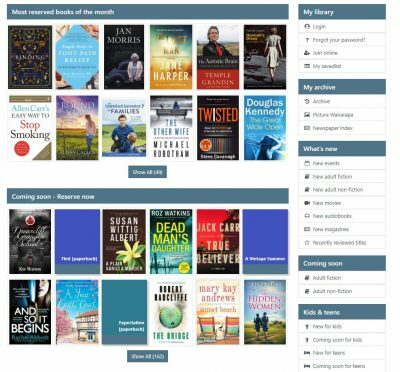 Access to our Similar Titles and Tags service from LibraryThing for Libraries. 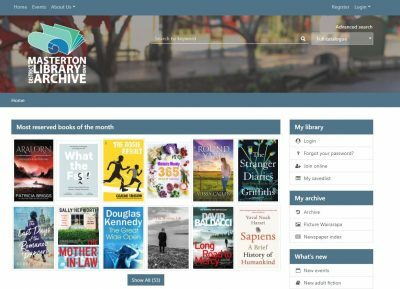 This service recommends similar titles and authors that are available in the Masterton Library catalogue. If you have read all the books by your favourite author and want to find other similar books to read, this is the service for you. Titles can be reserved directly from the Similar Authors service by clicking on the covers displayed. Fantastic Fiction – A comprehensive website with bibliographies for over 30,000 authors and information on over 350,000 books. You can search and browse, by authors or books. Series are listed in order of publication, and upcoming publications are also listed. An added hidden gem is the ‘Author recommends’ section at the bottom of each page! Goodreads – This website uses reader recommendations and ratings to rank titles. It lists books by genre and has the best books ratings from the previous year. The social media applications mean you can share your reading with others and make reading lists. LitReactor – LitReactor is the destination for writers and readers. Library Thing – A community of 1,600,000 book lovers. LibraryThing connects you to people who read what you do. Similar Authors – Similar Authors is a free service designed to promote reading by providing information about authors similar to those you already love, also known as readalikes. Literature Map – the tourist map of literature. Find a writer in the map. Searching the library catalogue just became easier! You can now search the library catalogue with just the click of a button from anywhere on the web. 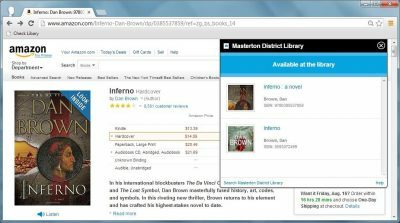 The “Check Library” bookmarklet lets you know whether a title is available at your library, or from bookstores and other websites across the web. And to use it, go to a book webpage and click the bookmarklet that is now in your browser’s bookmarks bar. All of the items listed in ‘What’s New’ and ‘Coming Soon’ are able to be reserved.